It is hard to believe I had my mind set on getting a Labrador when we first moved to the country and had space for a dog. Thankful my sister in law brought over Olivia pup who needed a home. She has made us all happy for the past 13 years. 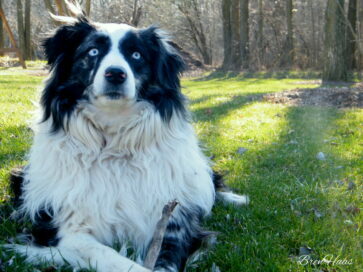 She is The Australian Shepherd Olivia Who Makes Us Happy. Olivia watching the birds fly over head. Energetic breed and ready to go and do things. Always one step ahead of you. Out in the garden with mom means paying attention and respecting what is growing. Being in the family sometimes means dress up time. 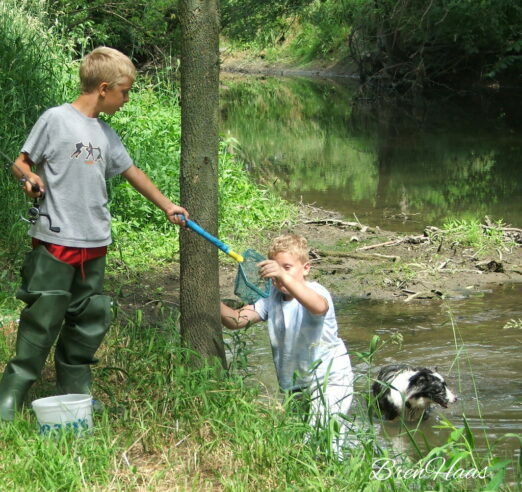 Many people ask me how does the Australian Shepherd engage with children being a herding dog. 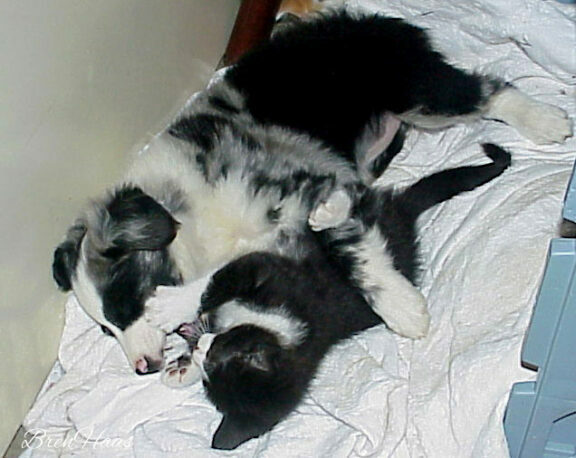 If you work with the Australian Shepherd it is super easy to get her break the habit of rounding up the children. Watching the kids play and enclosing her in the daily activities outdoors helped the puppy understand her job was to be a part of the family. 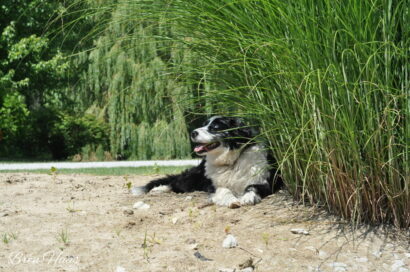 Olivia was our first dog and at the time we were cat people. She spent her first days sleeping in the kitty bin in the garage. Because she grew up and was directed to be kind to kitties she has always been respectful to the cats on our farm. 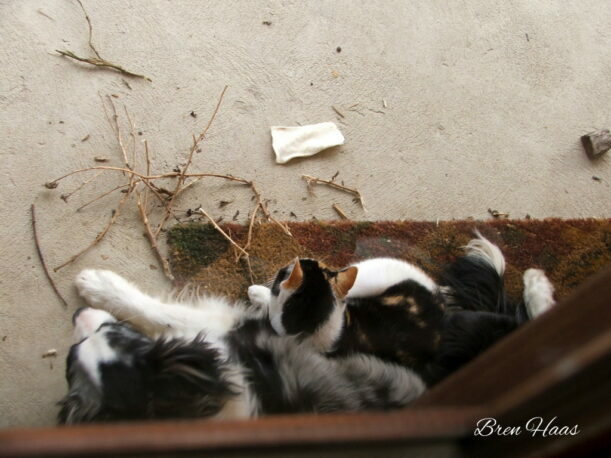 It wasn’t uncommon to find her cuddling on the front porch with the Calico kitty. When you introduce a new puppy to other members of your family be sure to keep an eye on how they are behaving. The animals may need direction and taught how to respect ones space. 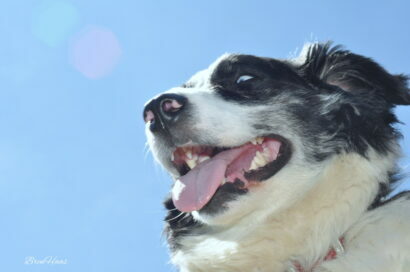 Below are some of my favorite photos of my dog Olivia. Olivia always finds a pine cone to tote around with her. 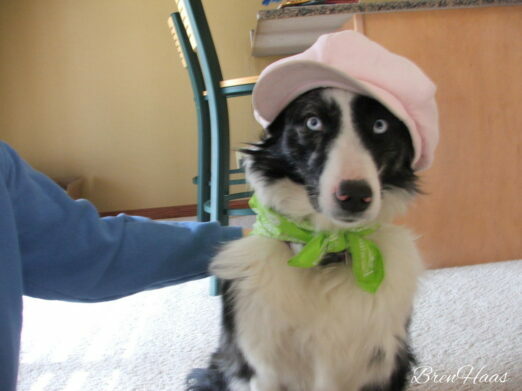 The Australian Shepherd, usually referred to as “Aussie”, is a medium-sized breed of dog that comes from ranches in the Western United States during the 19th century. This bred usually lives 13-15 years if taking care of properly. 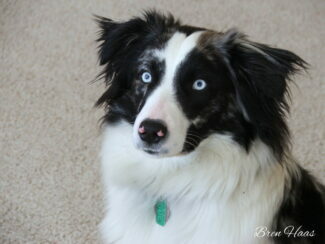 Aussies have beautiful colors such as Merle, Red Merle, Black, Red tricolor, Black tricolor, Blue Merle, Red. 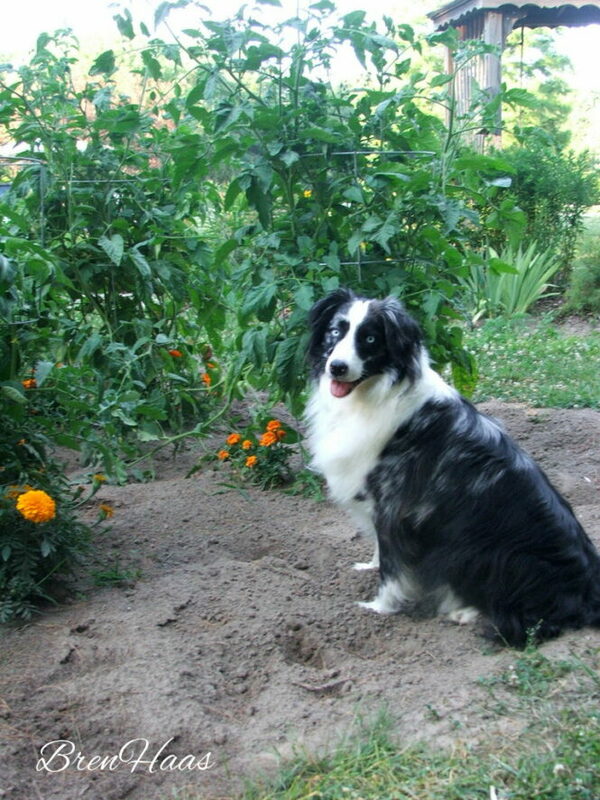 The Australian Shepherds are extremely smart and are healthiest when worked with. I’d love to hear about your puppy. Do you have a full breed and where did you get the pup? Please comment below or leave a message in my contact page so we can connect. **this post has been edited from a blog post I did back in 2012. I hope the information helps you decide on a bred for your family. Dogs jump up, not to knock you down, but to give a big kiss. A dog kiss isn’t exactly the same as human kisses. Puppies lick the mom-dog’s eyes and face to show deference. Adults give doggy kisses to humans they love and respect and aim at the face. Kneel to let him kiss you (if doggy smooches don’t bother you). Or offer your hand for a sniff-and-smooch instead. 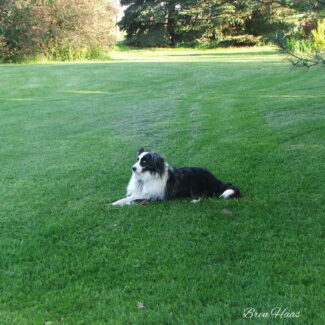 Love the blog post about your beautiful Aussie. I have three dogs that I love very much. LuLu is our little 19 pound beagle who is considered a “senior” now that she is just over eight years old. When my big German Shepherd/Malamute died in 2016, LuLu grieved for her old friend, so we got Daisy, part Great Pyrennes/Shepherd mix and LuLu was happy again. BUT, Daisy is a rough player and poor LuLu was having back and neck problems from the rough playing, so we now have added Pepper to the mix. 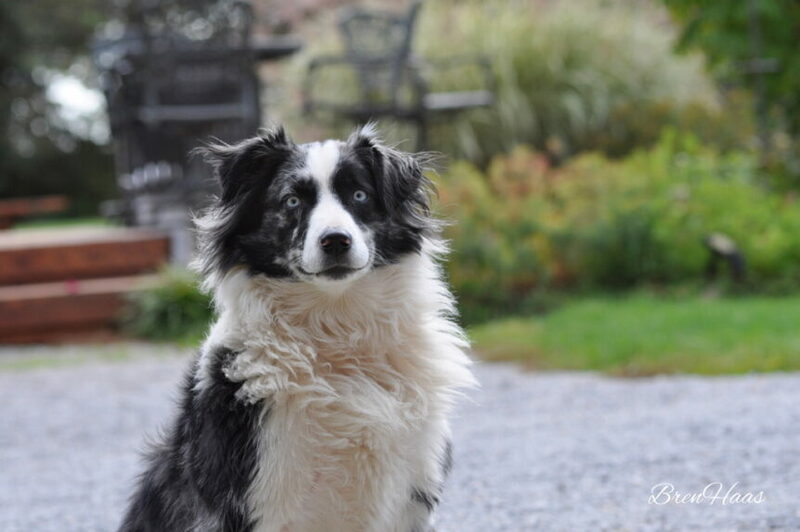 Pepper is a medium size “Aussie” mix who is working out great. She is a grand playmate and keeps Daisy happy and LuLu loves her and is enjoying not having back and neck problems anymore. I’ve never had an “Aussie” before but we are enjoying the new playmate for our dogs. Thanks for sharing your story about your “Aussie”. I love hearing about your pets Ginger – thank you for sharing with me. I worry about Olivia daily because she is getting up there in age. She is so frail and yet keeps going like she was a still a puppy. I hope you share more about your dogs with me soon.